OK, I know the Old Testament reading usually goes first. But this is Transfiguration Sunday and all the texts for the day all relate to the gospel. We can run, but we cannot hide. So, let’s start with the key story. Madeleine L’Engle talks about the function of myth as stories that can neither be proved nor disproved, but which describe the world and our place in it. (See http://www.csec.org/csec/sermon/l'engle_3501.htm ) She suggests that we not get tangled up in whether or how such stories happened, but what they are trying to tell us. That means that we simply tell the story to children. 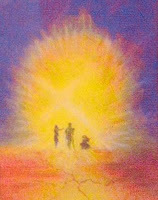 Artists have portrayed the transfiguration repeatedly. 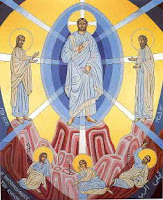 Google” transfiguration images” to find the images on this page and many others. After reading the story, show worshipers some of these pictures. Point out some of the differences in them. Give children paper and crayons with which to draw their own picture of the transfiguration. Invite them to post their pictures at a set place after the service for all to see. (Art can be taped to the altar rail, to any fencing at the front of the sanctuary, or on a door. The hymns based directly on this story are not very easy for children to sing. Instead sing hymns about Jesus’ power and glory. If you are going to bury the Alleluia next Sunday (Observing Lent and Celebrating Easter), sing “Come Christians Join to Sing” praising Jesus with repeated Alleluias. Even non-reading children can join in on the Alleluias. Present the Alleluia poster, explain what you will do with it next week, and display the poster throughout the service. Include lots of Alleluias in the rest of today’s liturgy. There are lots of examples of transfigurations in children’s literature. Cinderella is seen for the person she really is with the help of her fairy godmother. Simba seeing his reflection in a pond realizes that he really is father’s son and is meant to be the Lion King. There are others. Probably the best for preaching today is Fiona’s transfiguration in Shrek. In a whirl of light and special effects the beautiful princess becomes an large, loving ogre. Similarly, in a flash of light, Jesus who has been revealed to be the son of God “sets his face toward Jerusalem” claiming his task of suffering love. Tread carefully with the superheroes like Superman, Spiderman, etc. Each of these characters have super powers that are not obvious in their “everyday” persona. They use these unique powers to do what normal humans cannot do. In his transfiguration it is obvious that Jesus could call on some very spectacular powers, but he does not. Instead, he offers himself in self-sacrificing love. Unless you are steeped in the details of the lives and powers of the superheroes, I’d not bring them up. Child fans will talk you into inescapable corners and mire you in there in complex details. Finding all the similarities in this story about Moses surrounded by God’s presence on Mt Sinai and the story of Jesus’ transfiguration is better done in a church school class of older children where they can read both texts, search out the details and then talk about what they mean. All of these passages have connections to the transfiguration story, but those connections are not very significant to children. So, read and explore them for the adults. thanks for some good 'seed' ideas. Yes, there are some good ideas here.